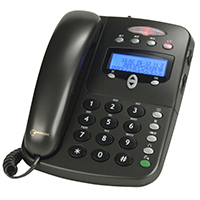 The Geemarc CL1400 business phone style is also ideally suited in environments with noisy backgrounds such as Restaurants, Hair Dressers, Canteens, Kitchens, Factories, Clubs, etc. It has a 99 name and number phone book and an extra bright visual ringer indicator. The Geemarc CL1400’s ringer level, tone and melody is adjustable with easy to use controls, hands free operation with separate volume adjustment, headphone, neckloop output sockets and it is hearing aid compatible. Geemarc CL1400 alerting options include a loud audible ringer with two volume settings, as well as an off setting, flashing light and a socket for the fitting of a vibrating pad (perfect for distance or nighttime alerting if the telephone is placed in the line of sight e.g. by the bed). Purchase your batteries at the same time and save on postage!